Ian Birrell of the Mail On Sunday has published an article on wildlife traffickers that were arrested in Nepal last October. One of them, a Pakistani named Jawaid Khan, has been in PEGAS’s crosshairs for several months. Khan has been smuggling chimps out of Kano, Nigeria, for years. PEGAS brought the story to Birrell’s attention and worked with him on it. The crate flown in from Istanbul was filled with exotic creatures for collectors: tantalus and patas monkeys, golden and ring-necked pheasants, scores of parrots and several dozen pigeons. The cargo quickly cleared customs and quarantine checks –thanks to a £4,400 bribe, say investigators – and was collected by a pair of local bird dealers in Kathmandu. Little did they know they were being observed by a special squad of Nepalese police investigating a major international wildlife smuggling ring. For also inside the crate – stuffed into a secretive middle section – were two infant chimpanzees, cowering in fear after being ripped from their slaughtered families in an African forest. The traumatised animals had been transported thousands of miles from their native lands and were at risk of dying of suffocation. They could barely be detected hidden among the more humdrum birds and monkeys. For these terrified chimps, barely a year old, suffering severe dehydration and shedding body weight inside their grim container, were prized assets in a barbaric global trade in great apes that is decimating the species. Such creatures can be sold for up to £50,000 to wealthy collectors in Asia and the Middle East – but for each one seized from the wild, up to ten of our closest genetic cousins are killed by poachers to get the babies demanded by buyers. The Central Bureau of Investigation team, acting on a tip-off from an informant, watched as the crate of creatures was taken to the nearby base of one of the dealers. There the dealers were joined by an Indian businessman and his assistant. The police moved in and arrested the four men on suspicion of settling a clandestine deal to shift the animals to India, which shares open borders with Nepal. Investigators suspect he could be a significant figure in the shady world of animal smuggling in which selfish crooks send baby apes in the most horrific conditions to collectors around the planet. They wonder whether he might be the figure known as ‘Jawaid Chimpanzee’ in the secretive forums where illicit deals are made and amid the furtive chatter of traders. Investigators suspect that Khan, whose social media sites show him routinely clutching baby chimpanzees and other rare animals such as white tiger cubs along with rapid-fire guns, has become one of the key players in a cruel industry. ‘This guy’s name would pop up again and again,’ said Doug Cress, chief executive of the World Association of Zoos and Aquariums and former head of a United Nations initiative to protect great apes. Great apes are among the world’s most intelligent and protected animals, and their sale is banned except from certified breeding centres. They have become a highly profitable part of the illegal wildlife trade, with baby gorillas fetching up to £200,000. Unlike trade in ivory or rhino horn, however, this involves fast transit of live animals. 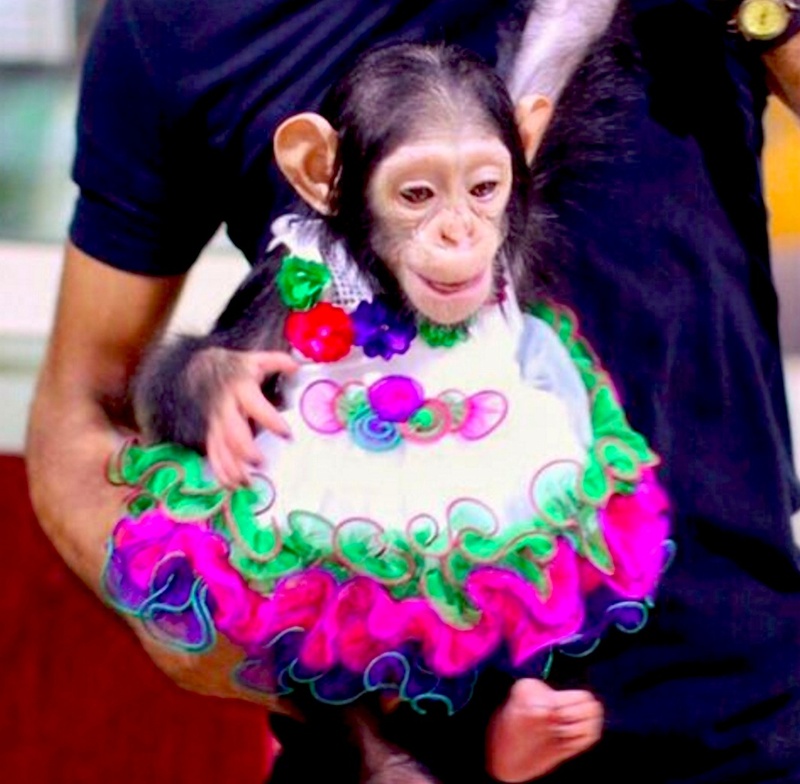 Often they are drugged and crammed into suitcases or containers; one baby chimp was even discovered in hand baggage scanned at Cairo airport. The buyers are rich families in the Arabian Gulf and Asia who often keep these sensitive and sociable creatures in solitary cages, dressing them up in children’s clothes then dumping, killing or selling them when they grow into more aggressive teenagers. Some have been taught to smoke, forced to wear make-up or simply beaten into performing the most banal tricks for their masters. Many end up as props for tourist pictures, performing stunts such as boxing in animal shows or suffering miserable incarceration for decades in dodgy zoos. Some are driven mad, making them hard to rehabilitate if rescued. This is why last year’s Nepal bust marks a significant breakthrough, since those usually caught are low-level poachers and traders on the ground in Africa, not the people suspected of running sophisticated global smuggling networks. Nepalese investigators suspect Khan was also sending smuggled chimpanzees to Bangladesh, Thailand and several other countries. Khan, currently held in Nepalese custody, is a familiar figure to those fighting the trade, such as Daniel Stiles, a Kenya-based conservationist who hunts smugglers. He has developed a network of informants and scans dark web sites and social media. Stiles said Khan’s name cropped up in previous investigations – including one that resulted in the capture of traders in Ivory Coast last year – and in online discussions. ‘They talk about Jawaid Chimpanzee because he holds so many chimps,’ he said. 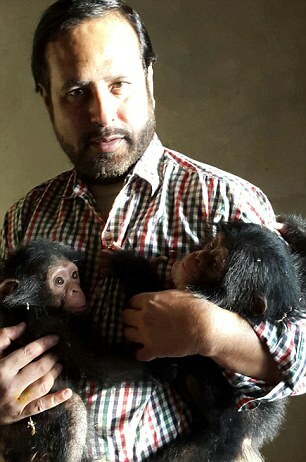 Khan has regularly posted pictures of baby chimps, sometimes in his arms, on his Facebook site as he travels the world. In one post, in May 2016, he replies to an enquiry asking if one of the infant apes can go to Pakistan, saying ‘why not’. 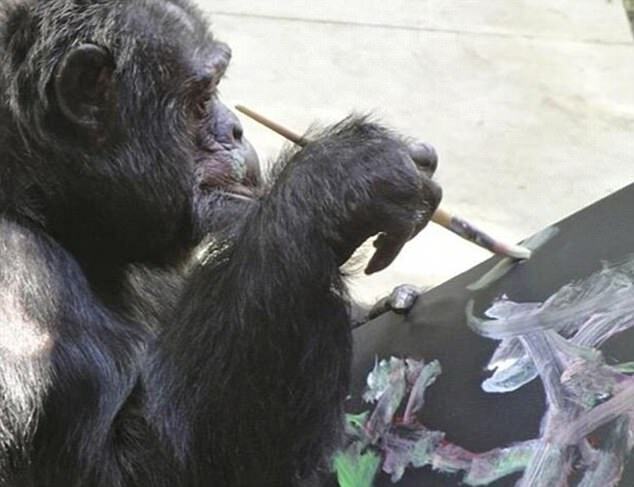 Under international rules to protect wildlife, chimpanzees have the highest protection. Their export is tightly controlled. Chimps sent abroad must be bred in recognised centres of captivity and destined for non-commercial use, while all trades must be registered. Stiles saw that Khan had posted a picture of two baby chimps in June last year on the site of a suspected Turkish animal smuggler with links to central Africa. He contacted Anil Jain – a biometrics expert and professor of computer science at Michigan State University who has been developing facial-recognition systems for wildlife – to help determine if these were the same animals seized in Kathmandu. ‘The scores indicate a high likelihood these are the same chimps,’ said Prof Jain last week. Khan’s social media postings discovered by Stiles also show other pictures of endangered species –and guns such as a semi-automatic Heckler & Koch rifle, plus a clip of bullets. They reveal he makes frequent trips to Kano, Nigeria – a noted centre for wildlife smuggling where the shipment for Nepal originated – and has made multiple trips to Istanbul, the transit point. He even posted online a snap of an airline boarding pass between the two cities. Other recent postings show giraffes and hippopotamuses packed into crates and lorries. There are images from Kano of wooden crates marked ‘Live Animals’ on a runway beside an aircraft – along with the message ‘congratulations boss’ from an employee of an African firm linked to the illicit trading of birds and bushmeat. Many key smugglers run firms that also legitimately trade animals. This helps mask illicit activities, aided by corrupt officials who assist them to evade customs and conservation controls in return for chunky pay-offs. A report being finalised by Global Financial Integrity, a Washington-based think tank, will reveal the chimpanzee trade is worth tens of millions of dollars annually – although those capturing them earn as little as £36 for each animal. The impact of their callous trade is catastrophic. It is thought that about 300,000 chimps survive in the wild, where they face threats from population growth, loss of habitat, conflict and poaching. They have been wiped out already in four countries. Poachers usually wipe out entire families or social groups to grab one cute infant, selling any slaughtered creatures for bushmeat. Adult chimpanzees are several times stronger than humans and can deliver savage bites. Some captives have their teeth pulled out, thumbs amputated to stop them climbing, or are hideously beaten with metal bars to control them. One landmark UN study revealed that 1,800 apes were discovered in 23 countries while being trafficked between 2005 and 2011. But over the same period there were only 27 arrests in Africa and Asia – and some of those held were not prosecuted. Yet there is a glimmer of good news. The two Kathmandu chimps have become friends and are recovering well from their trauma in Nepal’s Central Zoo while experts await results of DNA testing to discover if they hail from Nigeria or another African nation for safe return to a sanctuary. ‘These guys may have a happy ending and hopefully live for another 60 years,’ said Mr Cress. 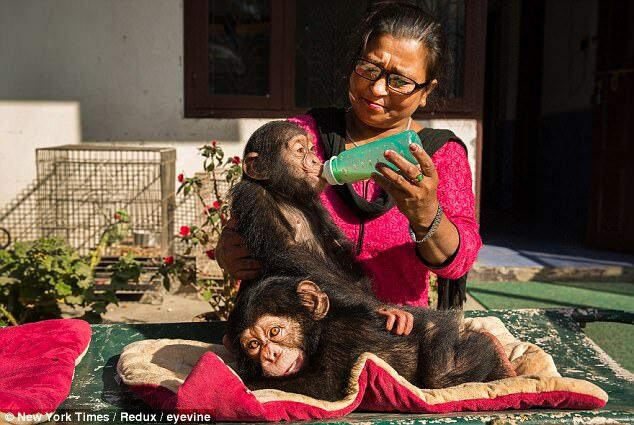 Will Chimpu and Champa, the names given to the chimpanzees, have a happy life? Nepal’s Central Zoo seems determined to keep them. The zoo is little better than the Abidjan Zoo where Nemley Junior, the chimp seized in the BBC sting, died. Ibrahima Traore and his brother Mohamed were out in six months after their arrest. This entry was posted in Uncategorized and tagged ape trafficking, Nepal, seized chimpanzee. Bookmark the permalink.